The missing nut and bolt head may eventually surface, but I’m not losing any sleep over them. I popped a replacement shear bolt from the heap (thank you, Aitch!) and thought the nut went on rather stiffly. The nuts have a crimp in the middle to make them vibration-proof, but this one seemed stiffer than usual and, lo and behold, the bolt snapped just before I thought the nut had gotten far enough. The nut on the second replacement shear bolt required much less torque, didn’t (let me) snap the bolt, and I finished the mission. That’s the third or fourth shear bolt I’ve used since getting the thrower in 2007, so there’s a package of six in transit. Part Number 710-0809A, 5/16-18 x 1.5 inch. (*) One of Mary’s gardening cronies works for a sporting goods store, has access to an unlimited supply of slightly bent ski poles, and shares the bounty for use as garden stakes. This entry was posted on 2016-12-24, 07:03 and is filed under Machine Shop. You can follow any responses to this entry through RSS 2.0. Both comments and pings are currently closed. 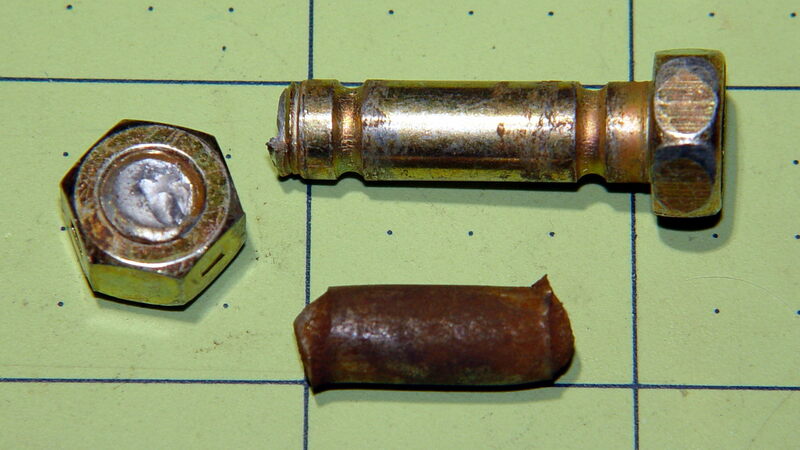 I put a couple of these shear bolts in a brown plastic pill vial and taped it to the snowblower handle. If/when it is needed I won’t have to hunt through my stash. (*) Gravel == decomposed granite. Some rocks are quite impressive, but the fist-sized ones do the most damage to the sheer bolts. Make that not well organized. Oops.